The ISO (International Standards Organisation), tasting glass is recognised worldwide as the standard shape for wine tasting. They are used all over the World by wine connoisseurs, vineyards, sommeliers and merchants. The glass is big enough to allow you to swirl the wine and there’s plenty of room to nose the wine too. What are ISO wine tasting glasses? International Standards Organisation or ISO wine glasses are recognised internationally as the standard design for wine tasting. The rounded bowl and narrow sides allow the wine to be swirled easily without any spillage. The rim helps contain aromas and enhances the appreciation whilst standardising the container. These glasses are scientifically designed to be used across a broad range of wine styles. You can sample all wines from just one glass- ingenious! ISO wine tasting glasses are used for a professional, comfortable and confident wine tasting experience. Wine tasting is a demanding activity and therefore needs the appropriate glassware. Why are ISO wine tasting glasses so popular? The stem prevents your hands from warming the wine. Suitable all wines (red, white, champagne, sparkling wines as well as fortified and distilled wines). Popular with restaurants, wine professionals and merchants. 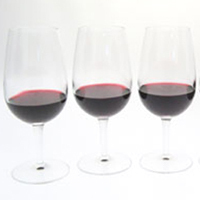 The Luigi Bormioli ISO type wine tasting glasses (21.5cl) are recognised as the standard size for wine tastings.